Represents the ideal of youth, beauty and innocence to his new acquaintances Basil and Lord Henry. He is the subject of the wonder and affection of Basil, and is immortalized in Basil’s painting as a living Adonis. His luck changes though, when he starts to become aware of the transience of his good looks. He becomes obsessed with staying young, but when his wish for the portrait to do his aging for him comes true, a horrible supernatural chain of events ensues. Dorian is heavily influenced by Lord Henry, who teaches him about hedonism, and Dorian seeks a life of pleasure and ruins his reputation. In the end, his vanity and selfishness ruin him, and the portrait provides a visual representation of the degradation of his soul, meaning that his life really does become art. The timeline below shows where the character Dorian Gray appears in The Picture of Dorian Gray. The colored dots and icons indicate which themes are associated with that appearance. Parfitt, Georgina. "The Picture of Dorian Gray Characters: Dorian Gray." LitCharts. LitCharts LLC, 17 Sep 2013. Web. 18 Mar 2019. Parfitt, Georgina. 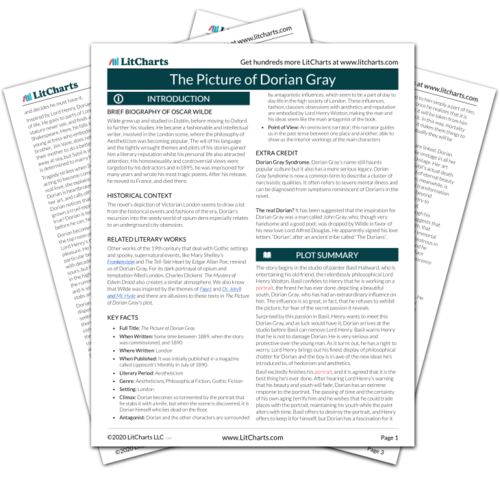 "The Picture of Dorian Gray Characters: Dorian Gray." LitCharts LLC, September 17, 2013. Retrieved March 18, 2019. https://www.litcharts.com/lit/the-picture-of-dorian-gray/characters/dorian-gray.